Today I would like to share with you what I believe will be a life-changing message of hope and love for us. Around 5 B.C., a historical figure named Jesus Bar Joseph (meaning son of Joseph) is recorded born in Bethlehem, Israel. This man lived highly influential and moral life thus made him to have billions of followers so far in the history. It is also known that this Jesus died by crucifixion, a notoriously cruel execution method during his time. Over the centuries the reality of a cross has been somehow beautified and degenerated. Many today hardly can grasp what the cross and crucifixion were really like, for in most parts of the world this brutal punishment has been abolished for good. The purpose of crucifixion was to provide a particularly painful, gruesome and public death. Crucifixion was considered a horrible way to die. The nicest form a person could be executed in Roman empire was the beheading and the cruelest form was the crucifixion. A common prelude was scourging, which would cause the victim to lose a large amount of blood and approach a state of shock. The prisoner then usually had to carry the horizontal beam to the place of execution, not necessarily the whole cross, often through a town center to receive all the embarrassments and mockings of neighbors. Crucifixion was typically carried out by specialized teams, consisting of a commanding centurion and four soldiers, who were anatomical experts. The victim was usually stripped naked (including the undergarments). The "nails" were tapered iron spikes approximately 5 to 7 inch (13 to 18 cm) long with a square shaft 3/8 inch (1 cm) across. In popular depictions of crucifixion, the victim is shown supported only by nails driven straight through the feet and the palms of the hands. However, scientifically speaking, the flesh of the hands cannot possibly support the victim's body weight. An idea of having ropes around the victim's arms was also generally not the case. Therefore, the nails were most likely inserted just above the wrist, between the two bones of the forearm (the radius and the ulna), or could also be driven through the wrist, in a space between four carpal bones (As some historians have suggested, the Gospel words in the Bible that are translated as "hands" may have in fact included everything below the mid-forearm.). Death could come in hours or days, depending on the health of those crucified and environmental circumstances. One theory holds that the typical cause of death was asphyxiation. When the whole body weight was supported by the stretched arms, the victim would have severe difficulty exhaling, due to hyper-expansion of the lungs. The victim would therefore have to draw himself up by his arms, or have his feet supported by a wood block. Indeed, Roman executioners were said to break the victim's legs, after he had hung for some time, in order to hasten his death. Once deprived of support and unable to lift himself, the victim would die within a few minutes (Refer to John 19:31-32). If death did not come from asphyxiation, it could result from a number of other causes, including physical shock, dehydration and exhaustion. In fact, crucifixion was only an arbitrary subset of a much wider continuous spectrum of slow and painful execution methods, which often included exposure to wild beasts and birds eating up the victim's legs and eyes while hung on a cross. However, the unusual rapidity of Jesus' death (Refer to John 19:33) was due to his previous sufferings and his great mental anguish. Jesus died in just about 6 hours (9:00 am - 3:00 pm). He literally died of a broken heart, a ruptured heart, and hence the flowing of blood and water from the wound made by the soldier's spear (Refer to John 19:34). The question is then, why did Jesus die in such a horrible manner of death? Human ideas and records have very little clues as to why this exceptionally good man had to die by such a cruel crucifixion except the reason of jealousy from the people around him. However, the Bible states much clearer clues as the reason of Jesus' death. The Bible puts it this way in order to provide the answer to this centuries-old question, which the history has constantly tried to answer it otherwise. The Bible says in John 3:16, "For God so loved the world that He gave His one and only Son (TO DIE FOR US), that whoever believes in him shall not perish but have eternal life". In other words, Jesus took our punishment and offered us remission of our sins (Refer to 2 Corinthians 5:21). Jesus took our sickness and pain and offered us healing and health (Refer 1 Peter 2:24, Matthew 8:17). Jesus took our sin and offered us his righteousness (Refer to 2 Corinthians 5:21 again). Jesus took our (spiritual) death and offered us his (spiritual) life (Refer to Romans 6:23). Jesus took our poverty and offered us abundance (Refer to 2 Corinthians 8:9). Jesus took our shame and offered us acceptance in God's family (Refer to Hebrews 12:2). Jesus took our rejection and offered us a share of his glory (Refer to Matthew 27:46). Also, Jesus redeemed us from the curse and offered us blessings (Refer to Galatians 3:13-14). Conclusively speaking, Jesus suffered and died for us to be made complete! One day when my son was sick I wished if there is any way I could be sick instead of him I would be willing to take his place, but I could not. When God saw the sins and misery of the world, He was willing to take our place and, unlike you and me, He was able to do so Him being the almighty God. So He became a man, died on our place and took away our sins and misery. The Bible states that is why Jesus died on a horrible cross, while he was all together innocent. Billions of both learned and unlearned, both rich and poor, both men and women, both Jew and non-Jews, and many more in the history have decided to believe the reason which the Bible points out as the reason of Jesus' death, and they have lived and died content with it. I have tried different religions of the world in past, including Buddhism, Islam and shamanistic Confucianism, which most of them I was deeply involved with their religious practices, only to result in greater disappointments and frustrations. While years of searches for the existence and identification of God, I was told a sentence of a word which changed the course of my life: "JESUS DIED FOR YOU!" Indeed, it puzzled me to the point to wonder why this stranger who lived almost 2000 years ago would die for me when no other religious figures dare to say that they died for me. After researching extensively on the life of Jesus and the way he died on the cross, I could not help but begin to think that if this innocent man died in such a terrible manner of crucifixion he might have died for a reason. Not long after this, I realized that it was for me and my sins that Jesus Christ died. I invited him into my life and since then he changed everything about me. And I'm happy that I made that decision. When I did not even know him nor I could imagine what loving me would cost to him, Jesus went to Calvary and loved me with a cross. And if it had not been for Jesus and the way he loved me then, I would still be lost in the endless searches for happiness and how worthy my life is. But years ago when my Creator met me in person, he showed what my life and I were worthy of. I realized that I was worthy of the cost of the life of God's Son. Our lives have genuine meanings only when they are saturated by the love Jesus showed us with his death on a cross. Therefore, if you have never met Jesus in your heart, simply talk to God at this moment - even if this may be the very first time you pray in your life - to come and meet you in a very personal way. If you have already met him and are following him as the Lord of your life, this message of the cross will give you power in your day-to-day life, no matter how tough and hard your situation may be. However, Christ challenges us even further. 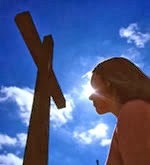 He says in Luke 9:23, "If anyone would come after me, he must deny himself and take up his cross daily and follow me." and in Luke 14:27, "Anyone who does not carry his cross and follow me cannot be my disciple." One sad statistic made on the State of the Church in U.S. reports that in a nationwide survey among born-again adults, none of the individuals interviewed said that the single, most important goal in their life was to be a committed "follower" of Jesus Christ. This tells us how ignorant many of us are about the love of God. The greatest expression of God's love for us is the CROSS! Then, what does it mean by taking up our cross daily? Love of the parents is a very precious thing and it has won the admiration of many people throughout the history. Indeed, most parents would give birth to their children at the cost of pain and raise them in a sacrificial way. But most of us begin to "understand" and to truly appreciate that great love of our own parents only when we would become parents ourselves. In fact, it is the same with our spiritual life. We begin to understand the love of God in greater depths only when we would minister to others and try to follow God's call in our lives. The Bible calls this effort as "carrying our own crosses" (Refer to Luke 9:23, Luke 14:27). When our hearts may be pierced with nails of disappointment, discouragement and even false accusation, while we are trying to win and raise others for Christ, many of us would better comprehend what it really means when God says that HE LOVES US. It also means that as Christ faithfully guarded his call to die for the world's sin by choosing to work as a carpenter, who would see the timbers, nails and a hammer everyday - the very materials by which he will die later on - we are called to live for our call with all our heart and might everyday! Therefore, dear ladies and gentlemen, and brothers and sisters, let us follow him each day with our crosses. Jesus Christ loved you with great suffering and death on the cross. Christ's love for you is "as strong as death" (Song of Songs 8:6) and "many waters cannot quench that love" (Song of Songs 8:7). So come get closer to Jesus now. You will find God's power for you to live each day in the love Jesus showed to you and me with a cross.